Inflatable boats have become very popular means of enjoying water sports and recreational boating activities. They are lightweight boats manufactured with their sides and bows made of flexible tubes having pressurized gas within them. They come in various sizes. In the boats that are longer than 3 meters (10ft), the floor usually consists of 3 to 5 rigid plywood or aluminum sheets fixed between the tubes but not joined rigidly together. 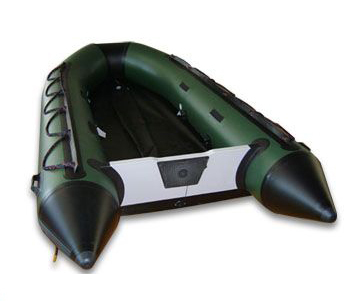 Some of the inflatable boats are portable and can be disassembled and packed into a small volume for easy storage. Such a boat, when inflated, is kept rigid crossways by a foldable removable thwart. It makes it appropriate to be used for life saving rafts for larger boats or aircraft, and for travel or recreational purposes. Fabrics Used for Making Inflatable Boats Many raw materials are used in the making of an inflatable boat. It may have rubber floors, either plain or inflatable, that might include steel, wood or aluminum sheets for rigidity. One of the very important raw materials for an inflatable boat is fabrics. A wide range of inflatable fabric is used for making these boats. For many years all inflatable boats used to be made of Neoprene/Hypalon or rubber materials. The developments in the materials and construction processes have made it possible to make inflatable boats out of strong plastic materials such as PVC too. Today most of the inflatables are made from PVC or Hypalon. Types of Inflatable Boats Inflatable boats are of many types. The most popular ones are rafts and kayaks. Inflatable Rafts: They are simple little platforms for about any type of activity that just requires 'something that floats'. They have several benefits like a 'not so bad' capacity of carrying load, safety given by different air chambers so that the raft doesn't sink along with other features provided by the manufacturers that vary from raft to raft. They are good boats for fishing on rivers and lakes and also work well for floating Class III whitewater sport. Inflatable kayaks: They are heavy duty boats as compared to the rafts. They are good for long-distance, can carry greater amount of weight and well suited for Class IV whitewater sport. They are good for those who look for long river voyages. These boats can be or cannot be rigid hull or multi hull depending upon the product specification decided by the manufacturers. For the sake of simplicity and knowing the basic process, the manufacturing process of a kayak has been discussed here. The Manufacturing Process A kayak, made of polyethylene fabric, has a body which is a long, hollow shell of uniform thickness. This body is made by a process called rotational molding. The seat and the other components are assembled manually. The shell may be molded in a single piece, or it may be made from two separate pieces that are joined later. Rotational molding requires fairly rounded contours. As a result, the one-piece shells can't have sharp intersections between surfaces. If the design needs to have a sharper intersection, for example, between the hull and the deck, then a two-piece shell is used. Following process describes the making of a two-piece shell. Thin-walled aluminum molds are used for the hull or the deck. Powdered or granulated polyethylene plastic in measured amounts are mixed with coloring agents and this mixture is loaded into the bottom of the two-piece mold. Hot air welding is the best way to join fabrics, like S700 hot air inflatable welding machine. A mechanical arm which holds the mold rotates it in two directions at the same time. After the mold is loaded, it is oven heated to 480-840 °F (250-450°C) in the heating station. As the heat from the mold melts the plastic, the mold is slowly rotated in two directions. Gravitational force leads the melted plastic to flow in all the directions into the rotating mold. As a result, it covers the entire surface with a uniformly thick coating of plastic. Continued heating fuses the melted plastic into a solid layer that attaches itself to the mold. In the cooling chamber, the mold is continually rotated and gradually cooled off with carefully directed sprays of air and then water. The hull or deck further hardens and shrinks away from the mold. Sometimes repeated cycles of heating and cooling are required to make the kayak properly. After the final cooling, it is removed from the mold. The design of the hull and deck are made in such a manner that they fit together at a single seam running horizontally along the length of the boat. Careful sealing is done to ensure that the shell functions as a single structural unit. A decorative strip can also be added to conceal the seam. Sometimes, a keel stiffener is bonded along the length of the shell for additional strength. Closed-cell foam flotation aids are inserted into each end of kayak that are held in place with the help of adhesive. Instead of this, some kayaks use inflatable flotation bags also. These flotation aids aim at keeping the kayak leveled and floating on the surface if, somehow, the craft capsize. If the kayak is designed for bulkheads, then these pieces are bonded in place and sealed with polyurethane sealant. Seat is suspended from straps attached to the sides. Alternatively, it may be supported by a piece of foam bonded to the inside of the bottom of the hull. Adjustable foot brackets or rudder pedals are joined at the inside of the shell, forward of the cockpit, with the help of non-corrosive metal fasteners. The hatch covers have waterproof gaskets installed before they are put in place and the grab loops are installed. A drain plug is inserted in a molded hole in the shell. The quality control checks are mostly done in the molding process. Proper rotation speed and oven temperature are crucial for producing shells with uniform thickness. To avoid shell warping, utmost care is required during the cooling process. The duration of the heating and cooling cycles, and the intervals between these stages have also to be done in a controlled manner.